Wireless technology is changing the playing field for building owners. That’s cool. Wireless technology drives devices that we use every day – our smart phones, tablets, laptops, GPS, and more. How cool is that for us? 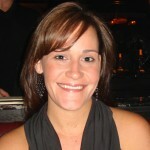 Wireless technology can also mean better performance and energy savings for commercial buildings. How cool is that for those buildings? But wait – what does wireless have to do with energy? Advanced wireless technology offers new choices for building controls and management. That’s important for making Building Management Systems (BMS) more affordable and energy-efficient. It’s also quite cool. Research by ENERGY STAR indicates that commercial office buildings waste as much as 30% of their energy consumption. A BMS can help control that energy use; however, existing buildings and smaller enterprises sometimes struggle to justify investing in a BMS, in part because a retrofit wiring installation can be cost-prohibitive and disruptive. With a wireless building management solution, there are significantly fewer wires to run…typically no renovation…and minimal disruption to business. Although wireless was once considered unreliable for building applications, the technology has overcome the earlier problems with interference and signal reach. Like I said, pretty cool stuff! The advantages of deploying modern wireless BMS solutions are significant: ease of installation, full scalability, and support for green initiatives. Also, wireless building systems can be secure and can use commercial, governmental, and military grade encryption with multilevel authentication. The wireless standards used in the majority of commercial buildings worldwide are EnOcean® and ZigBee®. 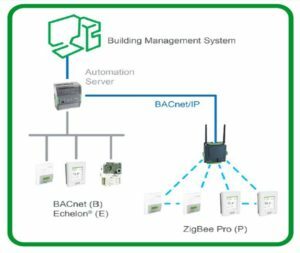 Building owners often find that the optimal solution for performance and energy use is a combination of wired and wireless EnOcean/ZigBee-based devices. For instance, a facility may rely on EnOcean products for lighting and room control, but use ZigBee-based devices for HVAC and network controllers. For commercial building owners and operators, investigating the benefits of wireless solutions can pay off in reduced energy costs and improved building performance. Want to dive a bit deeper? Download this free, brand new white paper from Schneider Electric, “Leveraging Wireless Technology to Reduce Building Energy Costs,” and explore how wireless technology can optimize building control and energy use in your facility. Let us know your thoughts, or questions, on this comprehensive and informative paper – leave a comment below for discussion. I agree, 100%. In existing buildings, the best solutions are wireless. And those solutions are very reliable. You can also add KNX wireless in your wireless standards. Thank you for your positive feedback. Schneider Electric does also sell KNX lighting solutions in Europe, however not wireless though. Hi Wouter, good point about Z-Wave. It’s certainly a worthy protocol and should be included in the next revision of our guide. 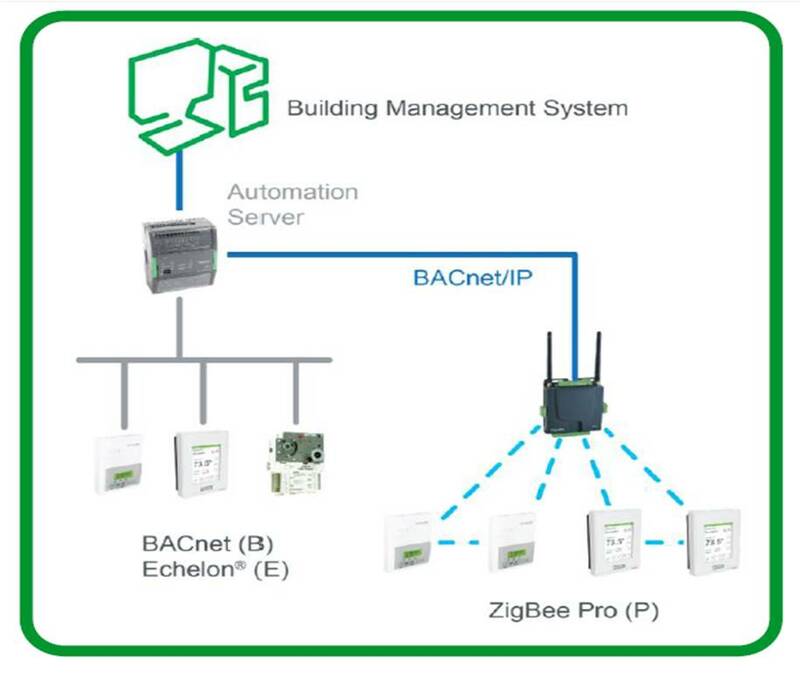 Z-Wave is not mentioned as it is not a globally available wireless protocol within Schneider Electric, while EnOcean and ZigBee are. That being said, we are supporting local product ranges as we would global ones and any product evolution would get the same transition and commitment you’ve come to expect from Schneider Electric. If you have more questions, please feel free to email me at jaimie.giarrusso@schneider-electric.com and I will be sure to get back to you! Thanks so much for your feedback. Hi Wouter, thanks for the comment. We do refer to Z-Wave on page 5 of the white paper and explain why we have focused on EnOcean and Zigbee as the dominant commercial wireless protocols. This should not be interpreted as vote against Z-Wave which is an important protocol in residential automation. Hello, nice article and white paper! Beyond enOcean & Zigbee, are Schneider electric looking into utilizing wide area network protocols as a standard that can be used in the BMS that could give even further wireless reach? For example LoRawan or sigfox? Indeed, LPWAN technologies such as Sigfox and LoRa will be opening up entirely new applications during the next 3-5 years as physical and software infrastructure is maturing. Schneider Electric is now working with this technology, installing pilot systems and developing business models for deployment. Exciting!